I hereby propose that the Academy of Motion Picture Arts and Sciences create a new category: best motion capture performance, a.k.a. best actor in digital clothing, a.k.a. best performance by a man or woman covered in zillions of electronic Post-its. The first winner — and, really, it’s long overdue — would be Andy Serkis, who gave slimy life to Gollum in “The Lord of the Rings” and “The Hobbit,” nearly saved Peter Jackson’s “King Kong” from itself, and who, in “Dawn of the Planet of the Apes,” provides the most regal performance of the year to date as Caesar, leader of the hyper-intelligent mutant simians who are poised to take over what’s left of Earth. In bearing, speech, and agonized expressiveness, Serkis’s Caesar conveys the conflicts of a king with almost Shakespearean grandeur. His thoughts and passions seem to will themselves past the megapixels onto our sensibilities. Is this art? Technology? Some devilish mixture of the two? When Caesar is onscreen, it’s a moot point. We’re simply watching a great performance. The rest of “Dawn of the Planet of the Apes” comes frustratingly close to that level of popcorn greatness while ultimately falling short. Director Matt Reeves (“Cloverfield”) and his army of technicians have created a vast, believable day-after-tomorrow landscape in which the remnants of humanity — decimated by the same man-made virus that has goosed the brainpower of the apes — fight a pitched battle against their ascendant cousins. Visually, this movie is big, bold, often awe-inspiring. Narratively, you’ve heard it all before, or at least many pieces of it, in countless blockbuster films and action dramas. This wasn’t the case with 2011’s “Rise of the Planet of the Apes,” which, by rooting its origin story in a credible here and now, rescued the dormant “Apes” franchise from our pop memories (and from the specter of Tim Burton’s awful 2001 remake). The climactic battle of the Golden Gate Bridge in “Rise” felt so real because everything up to then felt like it could actually happen. With “Dawn,” we’re embarked upon the path of “what-if” that — who knows? — may yet lead to some Charlton Heston lookalike stumbling onto a buried Statue of Liberty. For 10 years, the escaped chimps, gorillas, and orangutans have been living peaceably under Caesar’s rule in the Muir Woods north of San Francisco, building a civilization and honing their phonemes. With the discovery of an exploratory group of humans from the ruined metropolis, the old animosities flare anew. The human crew, headed by Malcolm (Jason Clarke), are under orders from their leader in the city, Dreyfus (Gary Oldman), to restart a dam and bring power back to San Francisco. 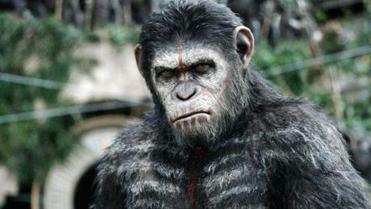 Caesar is reluctantly willing to broker a deal with the peaceable Malcolm, but bad apples on both sides tilt the two species toward war: the panicky human Carver (Kirk Acevedo) and the bitter one-eyed lab chimp, Koba (Toby Kebbell). Of the two, Carver is the greater cartoon; when Koba fingers his scars and reminds Caesar that this is the result of “human work,” the moment stays with you and stings. Maybe this is where our computerized movie wizardry has brought us: a film where the humans seem generic and the apes seem human. I doubt that’s the intent. “Dawn” sees the noble ideals of Caesar’s community, with its commandment against apes killing apes, collapsing as Koba discovers the stockpile of weapons amassed by the trigger-happy humans. The movie’s bleak message — “I see now how much like them we are” — is spoken toward the end by a disillusioned Caesar. But the predictable plotting and boilerplate dialogue of the script by Mark Bomback, Rick Jaffa, and Amanda Silver turns the anti-gun theme into heavy-handed rhetoric, and while you may be dazzled by “Dawn,” you’ll rarely be surprised by it. And forget about any damn-dirty-ape camp comedy; this one is grim business all the way. 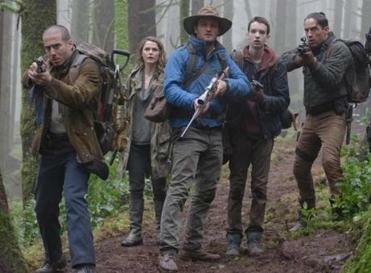 The human crew (at left, from left): Kirk Acevedo, Keri Russell, Jason Clarke, Kodi Smit-McPhee, and Enrique Murciano. Say this, though: I was never bored during the film’s 130 minutes. (Well, once: When Malcolm and his girlfriend, a medic played by a wan Keri Russell, have a farewell scene that could have been written by a computer.) There are details and characters I wanted more of: the scholarly orangutan (Karin Konoval) named Maurice in honor of actor Maurice Evans of the original 1968 “Planet of the Apes”; the scene where Caesar’s son, Blue Eyes (Nick Thurston), realizes the error of his rebellious ways in another startling display of motion-captured emotion; a bit where Koba fools a pair of idiot humans by pretending to be the clownish chimp they remember from sideshows and TV. Even the shots of ape armies in trees and on horseback have an out-of-this-world splendor. Note that all those scenes involve CGI simians rather than flesh-and-blood men, and consider with the appropriate degree of cynicism that Hollywood has become far better at creating characters who could never exist than characters who actually do. So here’s a thought for the inevitable next film in this series: Ditch the humans. Stick with the apes. They’re a lot more interesting.